Thanks for using Dokodemo Bible. This app enables you to read bibles anywhere because of no connection to the Internet. Reading aloud verses using Text-to-Speech. Displaying the sub bible's verse corresponding with the main bible's verse simultaneously. Printing kana along Chinese characters. 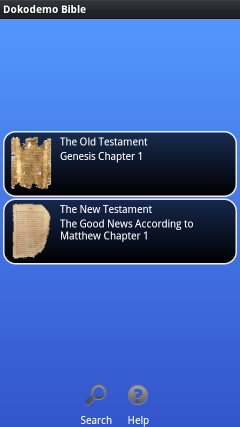 Dokodemo Bible supports only three bibles (口語訳聖書, World English Bible and KJV) so far. But I'll support other bibles as soon as I finish preparing them. Please wait until I have done. Executing the app, you see the main screen next image. You can change versions from a context menu. 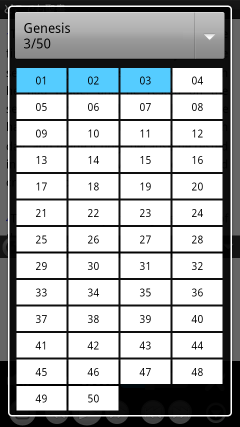 There are two buttons on the SplitPane titled Genesis. If you want to switch the main bible to the sub bible, touch the button on the left side. If you want to choose books, touch the button on the right side. If you want to use Text-to-Speech in Japanese, you need to install a TTS engine supporting the language. If you don't have it, you can install from the link below. If you want to listen to bibles with well pronouced voice, search for TTS on Google Play.